Can BioPro Diesel be the green energy alternative? 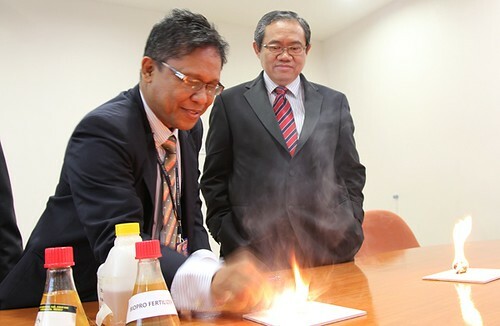 Few days ago Bernama carried an interesting article about BioPro Diesel, claimed to a breakthrough fuel invented by researchers from University of Malaya. If it is true to what the BioPro is billed for, this could probably solve the issues of palm oil wastes and pollution related to wastes disposal. BioPro diesel is derived from palm oil waste through bioprocess, i.e. using enzymes in a low pressure, low temperature process. Malaysia currently has about 420 palm oil mills mostly located in Johor, Sabah and Selangor, the potential is huge. UM scientists estimated that based on BioPro price of RM1.50/liter, total revenue from these palm oil mills could be up to RM40 billion per year. The investment? RM12 million is needed for a palm oil affluent process plant to produce 25 tonnes of BioPro diesel daily. The byproducts created during the extraction process can be used as fertilizer and water, which can then be reused at other industry applications. TheGreenMechanics' two cents: If this alternative fuel is super-clean, cheaper and can readily replace the conventional fossil diesel, they should speed it up and let us start using it immediately. Don't limit ourself to just the palm oil effluent, let's use some end-product palm oil as well.